In the land of Bergerac, the river Dordogne traces its way among hills covered in vines. Spending some time at a campsite in Bergerac means an opportunity to discover this luminous wine valley that stretches between Bergerac and the Montaigne castle grounds. During your trip, you’ll encounter vineyards with prestigious names such as Pécharmant, Monbazillac or Montravel. 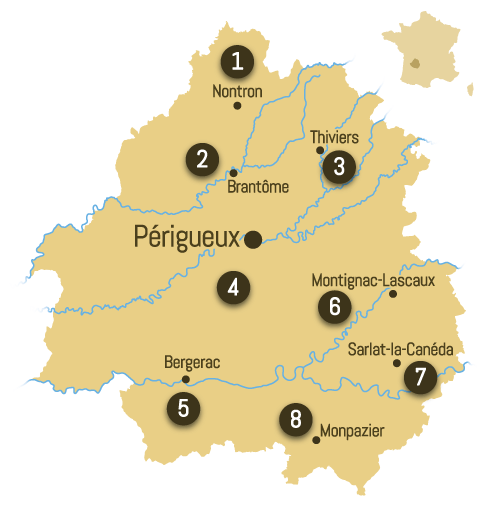 Take some time to meet some of these Périgord winemakers and to taste their vintages (always in moderation, that is). These wines make a perfect match with the gastronomic specialties of Dordogne such as foie gras, paté and walnuts. The many street markets, in towns and villages, are the ideal opportunity to discover these regional products... and take some of them back home of course! Camping in Bergerac will also reveal a land of history and traditions. Made famous by writer Edmond Rostand and his character of Cyrano de Bergerac, the town features its elegant Renaissance architecture on the banks of the river Dordogne. Further along, the castles of Monbazillac and Montaigne are both beautiful examples of combined Medieval and Renaissance styles. The former was built in 1550 and it is to this day completely furnished. A wine tasting session awaits you at the end of its visit. Montaigne castle was, appropriately, the philosopher's home. Notice the library tower, the first part of the estate to feature in the list of official historical monuments of France. Those among you staying at a campsite in Bergerac with a preference for more ancient periods need to go to the Gallo-Roman villa of Montcaret: it features beautiful mosaic-tiled thermal baths. Nature is very much preserved in this wine country and its landscapes are particularly suitable for hiking, especially on the way to Santiago de Compostela in Spain. One can also indulge in outdoor sports such as canoeing on the river, or biking through forests and vineyards. To share this bounty of nature, the campsites of Bergerac welcome you in this region. They offer pitches for caravans, tents and motor homes. You will also find more traditional and cosier rentals, like mobile homes, furnished tents or cottages, and unusual accommodations like tree houses. Discover availability, special offers and good deals from the campsites of Bergerac - the perfect mixture of nature, great food and History, with your friends, partner or family.